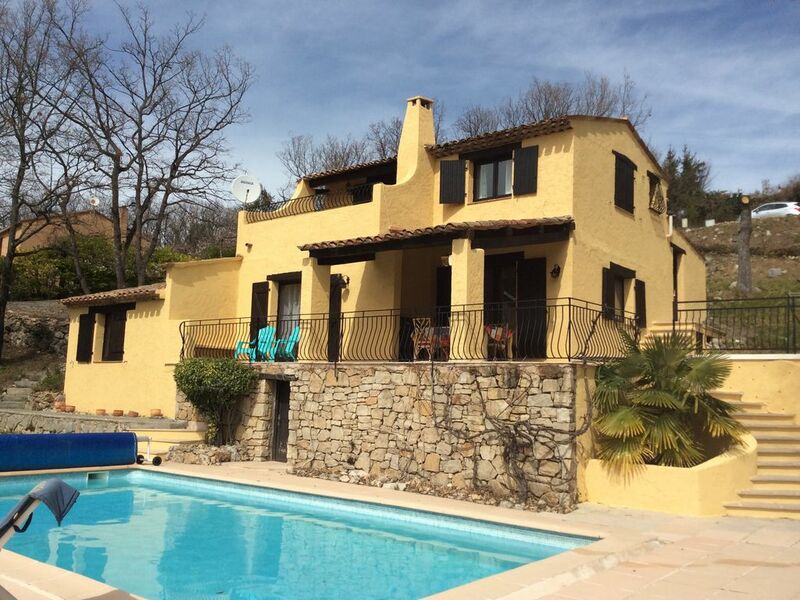 Nestling in the sun-drenched hills above Fayence lies Villa Serendipity , a comfortable and well equipped 3 bedroom villa with stunning , uninterrupted views of the Massif des Maures and Clos de l'Estourel . Fayence is renowned for it s many restaurants catering for every appetite and budget and it s colourful twice weekly markets , the Villa is ideally situated for peaceful holidays and exploring the region yet still within a half-hour drive of the bustle of Cannes . The private pool is not overlooked and with its south facing position has the sun all day . For early and late season holidays it can be heated , no holiday in the South of France is complete without a leisurely 'dip' . In the evenings the upper terrace is a haven of silence topped by a panorama of stars . New this year is a refurbished en-suite bathroom and also new living room furniture from which to relax and watch satellite tv or play one of the many games. Our helpful English and Dutch speaking caretakers also live nearby. Nederlandse gastvrouw , Nederlands Personeel !!!. Two long standing friends had a dream to purchase a retreat in France. Having holidayed for years in France enjoying and sampling the varied delights on offer, the two families decided on Fayence in the South of France. The draw of Provence proved too much; although other areas, the Dordogne and Burgundy, had many attributes and unique points the light, air and ambience of the south proved irresistable. Coupled with the fact that the region enjoys such a beautiful climate, basking in sunshine most of the year. 'Villa serendipity' ticked all our boxes. A private secluded property, yet not remote. With stunning views over the Esterel Mountains and beyond. The quality of light is amazing and much loved by artists. The property itself offers a balanced family accomodation, with the three bedroom two bathroom layout, enabling both privacy and space. The property is totally south facing. The shaded dining terrace overlooks the large swimming pool, bathing terrace and views beyond.There is an additional solarium, furnished with table and chairs for a tranquil retreat; enjoying the same views. Offering the option of escape, for that moment with a good book, a bottle of wine or simple reflection. A boule court in the garden facilitates a pre dinner pastime, or a distraction away from the sun-loungers. The property is ideally placed for dipping into the delights the Cote d'Azur, in addition to enjoying the feel,atmosphere and associated charm that the local hill villages have to offer. Visiting weekly markets selling locally sourced produce and wine contributes to a relaxing, enjoyable table of excellence the envy of many a region. Prestigious Four Seasons Terre Blanche 15 minutes away.Two championship courses. Totally private. South facing in full sun all day. Not overlooked, very tranquil. Villa Serendipity is superbly equipped for every day living. The lounge offers comfortable furniture arranged around an open fire. Satellite tv, hifi/cd player, books, games and videos add to the amenities. 3 bedrooms -1 double with en-suite and satellite tv. Large galleried landing with king- size sofabed (ideal for children). Superb upstairs sunterrace ideal for stargazing/cocktails. 2 twin bedrooms (one with sink and vanity unit) sharing a shower room and independent wc. Well equipped kitchen with utility room, additional fridge/freezer. Shady , sun dappled dining terrace off the kitchen with stunning views over the heated pool (11m x 5m by 1.5m depth) and countryside beyond. Gas barbecue, boules court and ample poolside furniture. Thanks Gerard for all your help & for a wonderfully relaxing holiday. Villa serendipity worked extremely well for our base, although to be honest, we spent the majority of our time at the house, as it was too difficult to tear ourselves away. The location is peaceful and private, and you can enjoy the sun or shade. The house is very well equipped & we made use of a high spec oven & the gas bbq. The villa was extremely well equipped with every thought provided for. A family of four with a 14 and 11 year old we loved the pool and its variety of terraces and outside spaces. The housekeeper Handan was so helpful and welcoming. A peaceful and calm place in a beautiful part of France. We are so pleased you enjoyed your stay at 'Serendipity', we very much look forward to welcoming you back one day. It was the most relaxing holiday we have ever had. The villa is spotless and Handan is lovely and very obliging. The pool is wonderful, very private with fantastic views. The villa has everything you could want on holiday and is in a beautiful setting. There is plenty to do and see locally and Fayence is a very nice village with plenty of restaurants. Gerrard is a pleasure to deal with and nothing is too much trouble he is a mine of information from best beach to car hire. We had such a lovely relaxing holiday we have booked again. Het karakteristieke huis ademt een sfeer van rust en gezelligheid uit. Alles is netjes en schoon en ziet er verzorgd uit. De verschillende ruimtes bieden de mogelijkheid om rustig alleen te zitten, maar staan ook dusdanig met elkaar in verbinding. De vernieuwde keuken is voorzien van al het nodige om een lekkere maaltijd klaar te maken. Vanuit de woonkeuken stap je zo het terras op voor een heerlijk (schaduw) moment buiten. Ook de huiskamer heeft een eigen terras-opgang. Het zwembad nodigt uit om veel tijd in en langs het water te besteden. De slaapkamers zijn met zorg aangekleed en ingericht. De gastvrijheid en zorg van de gastvrouw dragen bij aan een onvergetelijk verblijf. If you want a peaceful and quit Holiday Home - this will not fail!! The house was fully equipped and everything was nice and clean and well maintained. We (2 adults and 2 bigger kids) had a wonderful 2 weeks of vacation here. It was a pleasure to communicate with Gerrard (the tenant) - and we will return again. Beautifully situated in two acres of woodland in the hills above Fayence, the villa enjoys a peaceful and secluded location with spectacular views and privacy. Beaches, golf, lakes and gorges within 15 miles. Nice airport 45 min away. Numerous renowned restaurants in locally to suit both palate and budget, everything ranging from simple delicious pizzerias to michelin starred establishments. The local wines can be sampled before purchase at many of the award winning local vineyards. A day trip to both Monte Carlo and The Gorge du Verdon is a must. Highlighting the different attributes of both nature and a man made basin of decadence. People watch in Monte Carlo and explore the stunning Marina and Grimaldi Castle. In the Gorge you can choose to drive the scenic perimeter or indulge in one of the many guided activities, such as water-hiking, rafting or canoeing. The beaches are close to hand and a day or two being spoiled on a private beach with a quality restaurant a few steps away is a relaxing treat. Many of the restaurants also offer valet parking. Other Activities: Gliding. Golf. Walking.Tennis.